Navy ocean engineering is concerned specifically with the development and support of advanced equipment and technologies for underwater search, rescue, salvage, construction, environmental prediction, and related underwater endeavors. Ocean Engineering supports the Navy sea-floor missions. The program includes research in equipment, fixed structures, and installations on the ocean floor. Other investigations of equal importance involve developing new and more effective equipment and procedures for salvage at sea. Naval Special Warfare (NSW) is a component of Special Operations Force, and it is postured to fight a globally dispersed enemy both ashore and afloat. American NSW forces maintain a continuous global presence, typically operate in small groups, and have the ability to deploy rapidly and clandestinely into an extremely broad range of austere and harsh environmental conditions from sea, air, or land. NSW operates across the spectrum of conflict -- including activities other than war -- and focuses on two core missions: special reconnaissance and direct action. These missions typically involve transit to an area of operations, gaining access to targets of interest, and transit out. The fictional National Underwater & Marine Agency is the focus of more than a quarter century of chronicling the aquatic adventures of action hero Dirt Pitt. Clive Cussler dispenses fast action, larger-than-life characters, less-than-graceful prose, credulity-stretching scenarios, and high-saltwater content that are his trademarks. Reading a Clive Cussler novel is like watching several movies at once. He's a master of the jump cut, moving the action from one continent to another with an entirely different cast of characters, good guys and bad, in each place. He always manages to pull the various characters, plots, and counterplots together, though, and the heroes always triumph in the end after saving the world. In his life away from the written word, Cussler has searched for lost aircraft, led expeditions to find famous shipwrecks, and garnered an amazing record of success. With his own NUMA crew of volunteers, Cussler has discovered more than sixty lost ships of historic significance, including the long-lost Confederate submarine Hunley. Ocean engineering has made many strides since, yet the challenges of working at the bottom of the ocean means that much work is still conducted from ships by lowering dredges and instruments into the depths. Submersibles, some that carry scientists and others that operate by remote control, are of limited use because they are expensive and can't be launched in foul weather. Shortly after 1800, the use of compressed air supplied from a pump on the surface was introduced, and in 1837, the "closed" diving dress invented by Augustus Seible provided the diver a limited mobility on the ocean floor. This "hard-hat" dress, consisting of a heavy metal helmet and waterproofed canvas suit, with air supplied through an "air umbilical" by surface pumps and exhausted into the sea. By 1940, the self-contained underwater breathing apparatus (SCUBA) had been developed to a practicial stage, and the first American SCUBA divers started training in 1942 for duty with the Office of Strategic Services (OSS), the predecessor of the CIA. Free diving was further advanced in 1943 with the introduction of the Cousteau Aqua Lung, which provided both a back-packed air supply and a demand regulator. While the recommended maximum depth for conventional scuba diving is 130 feet, technical divers may work in the range of 170 feet to 350 feet, sometimes even deeper. Hard-hat and SCUBA divers breathing either air or mixed gasses during relatively brief excursions into the sea are now known as "conventional" divers. This term became necessary upon the introduction of "saturation" diving in 1957. This form of diving, in which the diver's body tissue is saturated to capacity with a pressurized mixture of helium, nitrogen, and oxygen, permits long periods of submergence. Extended periods of compression and decompression are necessary before and after saturation diving. Most diving suits are ambient pressure (“soft”) suits that protect their wearers from the cold and surrounding environment, but not from the pressure of the water. 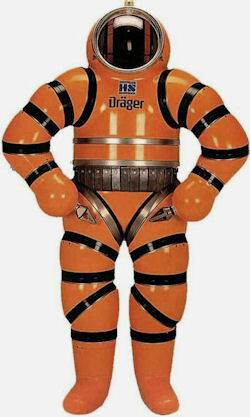 At extreme depths, an atmospheric pressure (“hard”) suit maintains surface pressure internally, insulating its operator from environmental pressures and eliminating the need for decompression after a dive. These atmospheric diving suits (ADS) function as one-man submersibles that possess articulated joints to allow their operators to move and interact with the surrounding environment. ADS were originally created for commercial reasons — initially for salvage and underwater construction work, and later for use in the oil industry. In 2007 a US Navy diver submerged 2,000 feet, setting a record using the new Atmospheric Diving System (ADS) suit, off the coast of La Jolla, Calif. Chief Navy Diver (DSW/SS) Daniel P. Jackson of Navy Reserve Deep Submergence Unit (DSU) was randomly selected to certify the ADS suit for use by the Navy. The certification was the culmination of 11 years of planning, designing and testing by multiple agencies to develop the ADS suit, also known as the Hardsuit 2000. The self-propelled undersea vehicle originally conceived during the American Revolution became operationally effective by the end of the nineteenth century. Modern pressure-capsule undersea vehicles are small and limited in crew size, payload, and cruising range. Unlike the submarine, they are dependent on special surface vessels for delivery to an operating site as well as for support during a mission. Saturation diving pays about $1,000 per 24-hour day. Most people are attracted to diving by a sense of adventure, as well as by the promise of a well-paying career. United States Armed Forces members are entitled to special pay for diving duty for periods during which they are: Assigned by orders to diving duty; Required to maintain proficiency as a diver by frequent and regular dives; and They are either actually performing diving duty while serving in an assignment for which diving is a primary duty; or meeting the requirements to maintain proficiency while serving in an assignment that includes diving duty other than as a primary duty. Military personnel are entitled to diving duty pay of up to $240 for officers and up to $340 for enlisted per month. Divers receive monetary incentives to dive deeper, stay down longer, and finish jobs sooner. Marine engineering and construction advanced by improvisation and trial-and-error, and error could be harmful to the environment and debilitating or fatal to workers. Death and injury were viewed as the unfortunate prices to pay for technological progress. safety was compromised not only by the sheer technological challenges, but by the necessity to complete work as quickly as possible. Offshore installations were expensive to build and operate. The profitability of projects often depended on how soon production could be brought online. Production processes were highly interdependent, and delay in one section could cause delays elsewhere. And delays cost money. So there was incredible time pressure to drill the wells, install the platforms, and get the oil and gas flowing. By the late 1950s, diving had become an essential adjunct to offshore petroleum operations. As divers were asked to go deeper and stay down longer, they became guinea pigs in experiments with decompression, breathing-gas mixtures, and “saturation” techniques. Hardhat divers earn good money but work long hours in dangerous conditions. Divers were under incredible pressure to perform and take risks, even more so than other offshore occupations. Pride and competition with other divers led to unusual risk-taking. Commercial diving operations include: off-shore oil rig and pipeline maintenance and repair; salvage operations; bridge and pier construction, inspection and repair; power plant intake and discharge construction, inspection and repair; ship and barge inspection and repair; dam construction, inspection and repair; scientific study; emergency response, investigation and recovery operations; and seafood harvesting and underwater agriculture. Commercial divers are apart from the mainstream and most take great pride and satisfaction on being able to do a job that few other individuals can. In a era when it is common to find individuals in their 40s embarking on a second career, it is rare to find anyone that age still working as a diver in this industry. The major reason is the stress of working in an underwater environment has on the body while doing hard, laborious work. Studies have indicated that there is a significant relationship between one's age and how quickly their bodies can expel nitrogen which can pose a greater risk for the bends. In recent years there has been a significant downward trend in mortality rates in the commercial diver population due to improved diving techniques and operations. These workers are exposed to the hazards anyone would if they spent extended periods of time underwater, such as drowning, respiratory and circulatory problems, and hypothermia. The number of dives, length of time spent underwater, lack of visibility, and the strenuous nature of the task increase the risk of this type of activity. Additionally, commercial divers are often exposed to construction or demolition type hazards such as cutting, welding, material handling, cleaning, operation of heavy equipment, and general work with power tools.